Mint Has Overtaken My Garden and Heading for the Grass. How do I get rid of it and be able to plant vegies soon? Is round-up a good idea? If so, how long should I wait to replant with tomatoes, chard, etc? I live in Las Vegas, NV so anytime now is okay to plant. Round-up will work and you can plant in about 1 week (2 weeks to be on the safe-safe side) after using it. That being said, you will likely see the mint come back regardless. 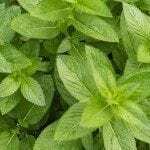 No matter what you do, you will need to lay down a heavy layer of mulch and/or a weed blocker like newspaper to help kill off the roots of the mint plants.